Airbrushed line by line to create directional fields of colour, Guillet’s artwork is meant to convey subtle psychological resonances and evoke moods and new-found states of mind. Artist Statement: Guillet responds to the emotional side of art by transforming spaces with large sheets of directional fields of colour. His philosophy is that art should move people and his mode is projecting colour. He creates complex colour schemes with complimentary muted and vibrant tones. The effect resonates psychologically and evokes a subtle shift in mood for the viewer. Biography: Glenn Guillet was raised in Edmonton’s vibrant Garneau neighbourhood. Art was an important part of his life right from his early years, as evidenced from his first art award in grade six. A few years after finishing his Bachelor of Fine Arts at the University of Alberta in 1971, Guillet opened a studio practice that has lasted 42 years and counting. 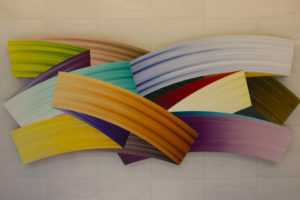 Art lovers can find Guillet’s artwork in both public and private collections throughout Alberta including, Edmonton’s City Hall, Cross Cancer Institute, Citadel Theatre, and Athabasca University.